Students and staff are proud of their college. They display this in their preparedness to celebrate the spirit that is Mount Alvernia by participating in the variety of opportunities to demonstrate or support our commitment to being an inclusive community. The spirit of Mount Alvernia is a genuine feeling of pride and sense of belonging for all who come into contact with the College, especially present students, staff and Alumnae. From the moment you enter our school grounds, you have a sense of the College’s heritage; you will experience a sense of community. From the way the students dress and conduct themselves to the professionalism of staff, from the beauty of the gardens to the new state-of-the-art facilities, to the proud honour rolls and Christian devotion. This is a college that is at the forefront of academic and cultural excellence whilst blending tradition with administrative innovation and strong values. The spirit of Mount Alvernia is an immense feeling of association with the College and all that it stands for. 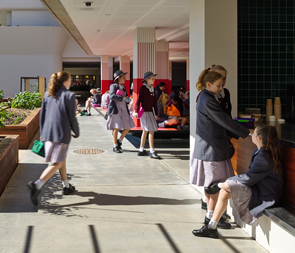 With a history spanning 61 years and over 10,000 alumnae, Mount Alvernia College remains one of the top girls’ schools in Queensland. The students who form this committee are dedicated to ensuring new parents, students and staff are welcomed into the community. They are also responsible for providing hospitality and tours to school visitors. Membership is determined by dedication to the role. The students in this committee need to be available for both in school and out-of-hour activities such as Parent Nights and Open Day. These students assist in ensuring all students feel safe at Mount Alvernia. They assist in the formation of practices, such as online reporting, that promote Mount Alvernia as a safe and inclusive community. They provide solutions to problems and create ideas to encourage desired behaviours. The Spirit Squad is a dedicated cheer squad with whole-school emphasis on developing students’ knowledge of cheers and chants. Their task is to compose new cheers as well as revisit the old. Students in this committee are required to attend regular meetings to practise and prepare for providing vocal support to students representing Mount Alvernia.